Surveyor Peterborough| About Us | Elliott & Parr Surveyors Ltd.
A locally owned and operated company, Elliott & Parr Ltd.'s reputation is one of accurate and responsible service in the community. Forward thinkers, we are committed to using cutting-edge technologies to provide cost-effective and efficient service for our clients in Peterborough and surrounding areas. Our firm is led by Shawn O' Connor O.L.S., O.L.I.P., and consists of administrative staff, draftsmen, survey technicians, and title searcher. 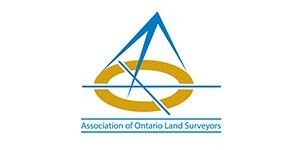 Members of the Association of Ontario Land Surveyors, we adhere ourselves to the highest standards of professionalism and quality service. Our firm can assist you with site plans, property boundaries, lot creation, building, development and more. Please contact us to get started on your survey.